The Canon in D by Johann Pachelbel is a composition well known throughout the world. It's a piece of music that is played in commercials, feature films, and shopping mall music systems. Its melody and harmony are such that, when heard, spur an "I know this song" reaction in listeners. Pachelbel wrote this music around 1680. Its exact name is 'Canon and Gigue in D Major for three Violins and Basso Continuo'. It's now called, in regular parlance, the Canon in D (or D Major). This canon was the only one that Pachelbel wrote. He wrote it as a piece of chamber music. Chamber music is a form of classical music originally intended for performance in a palace chamber. This type of music is for a small group of instrumentalists. One performer plays each separate part of the music. Written for the bass and the violin and for small rooms, this song is not limited to that today. A wide variety of instruments in small and large musician groups perform this famous piece each year. The term 'canon' in the title of the song refers to the type of music. A canon is a music of staggered singing or playing. In a canon, different instruments or singers start playing music. However, they do not start at the exact same time. They enter into the song one after another. The key to the canon is that they play the exact same sequence of notes. This results in intriguing variety and song complexity. The note sequence in Canon in D Major is what catches one's ear. It is now a famous chord progression, which we recognize whenever and wherever we are. The song has a bass line-harmonic pattern, two bars long. This sequence repeats throughout the piece. The staggered singing or playing (the canon) plays over this repeating sequence of notes. Johann Pachelbel was born in Nuremberg, Germany in 1653. He lived and worked during the Baroque period of classical music. He was an organist, composer, and teacher in his life, who wrote much keyboard music for the organ. He wrote church music and secular music, holding jobs as a church organist throughout his career. In fact, he established himself as a musician of stature in Erfurt, Germany. Here he was church organist at the Protestant Predigerkirchie (Lutheran Preacher's Church) starting in the year 1678. Erfurt was the Bach family's land of ancestral roots. Pachelbel actually taught Johann Christoph Bach, who was Johann Sebastian Bach's older brother. Pachelbel also worked as an organist in the Court at Stuggart and the Court at Gotha in Germany. In 1695, he became organist at the Church of St. Sebald in Nuremberg. He replaced his former teacher, the German organist, and composer, George Caspar Wecker here upon the latter's death. 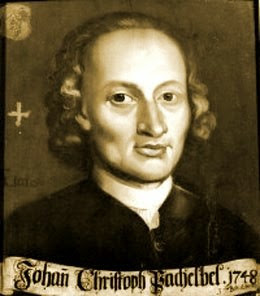 Pachelbel wrote chorale variations for the keyboard. Written in his day for organ and harpsichord they receive treatment on modern pianos of today as well. In this type of music, the chorale melody is the theme, and then the performer plays variations of this theme. Although famous for his Canon in D today, Pachelbel also wrote toccatas, fantasies, and fugues. One important and impressive work is the Hexachordum Apollinis, which is a set of six keyboard arias and their variations. The Canon in D Major continues to inspire listeners, piano players, and musicians of all sorts today. It's a 'musical' canon of great power that has endured through the centuries. Duane Shinn is the author of the popular online newsletter on piano chords, available free at Exciting Piano Chords and Chord Progressions!